Mary Savage moved to Homewood when she was 19, and she began planting from day one. She grew gardens and tended to more than a dozen vacant lots around the neighborhood, adding beauty wherever she could. Now 87, she says the community could always tell where she had been because they’d notice that those neglected empty lots didn’t just get cleaned up once. They were well maintained even as the years rolled by. The Homewood community has been impacted by challenges and disparities over the years, including a declining population. But a boots on the ground approach by local organizations and people like Mary has remained a constant — and that mindset has set forth revitalization in some areas. 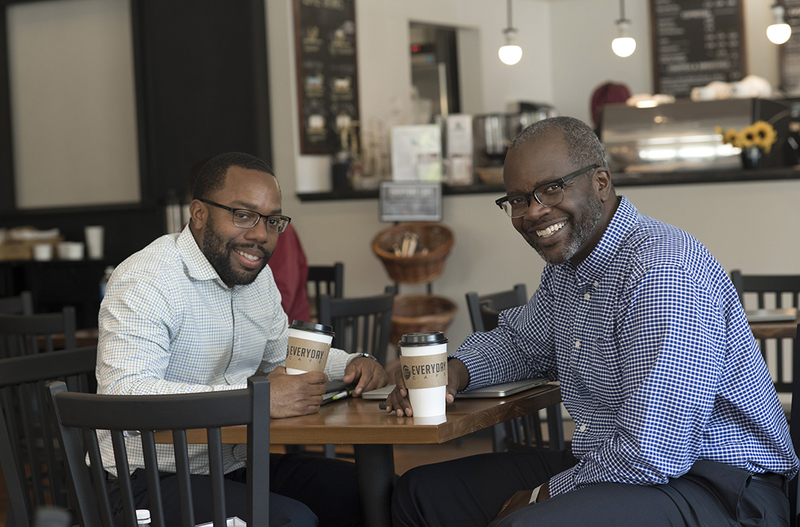 John Wallace Jr. (right) with friend Jason Jones (left) at Everday Cafe in Homewood. Photo by Martha Rial. “I’m certainly old enough to remember Homewood being active and busy, and there were places like that when I was a kid growing up,” Wallace says. The café uses some produce and herbs that are grown in the bioshelter on Fleury Way, a project initiated by the University of Pittsburgh in 2011. The solar-powered greenhouse is just one example of the university’s deep-rooted engagement in Homewood. Wallace says Pitt’s involvement in the community spans back to 1976, when a professor helped found Primary Care Health Services. “I think it’s that sort of deep history of community organizing and community development work that made the relationship between Pitt and the community so strong,” Wallace says. Opening in September, this will be the first CEC in the neighborhood. It “is guided by a 33-member advisory council and a majority of those people are from Homewood,” says Ellerbee. Everything in the center will be free for the public to use: Phase one will include a computer and science lab, classrooms and conference room space, among other amenities. Operation Better Block’s executive director Jerome Jackson and Larry Feick, interim president of the University of Pittsburgh, at MAC. Image courtesy of MAC. 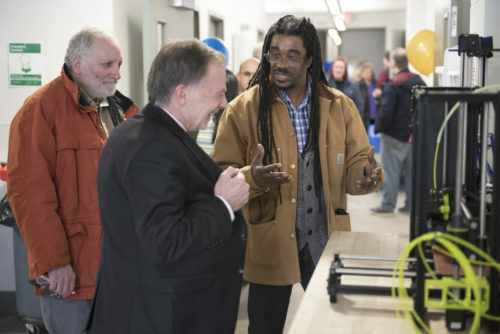 Located at 7800 Susquehanna St., the maker and manufacturing movement rooted in Homewood brought together a group of individuals and programs that are not just amazing for Pittsburgh, but nationally pretty impressive, Wallace says. This 150,000-square-foot building, owned by Bridgeway Capital, houses a handful of businesses including Thread International. Founded in 2011, the company works with locals in Haiti to collect plastic bottles that are then ground down and turned into fabric. The fabric is sent to Homewood where stitchers turn the material into different products. A number of employees are from the neighborhood. The Trade Institute of Pittsburgh (TIP) and the University of Pittsburgh’s Manufacturing Assistance Center (MAC) are also located at 7800 Susquehanna. Both offer workforce development programs that cater to merging and growing industries. At TIP and MAC, people can get technical assistance in trade work and advanced manufacturing that can help them find lucrative ways to participate in Pittsburgh’s changing economy. The organizations also offer training and hiring assistance for workers with prior convictions, which can be life-changing: Past incarceration can often be a roadblock to finding a good job. 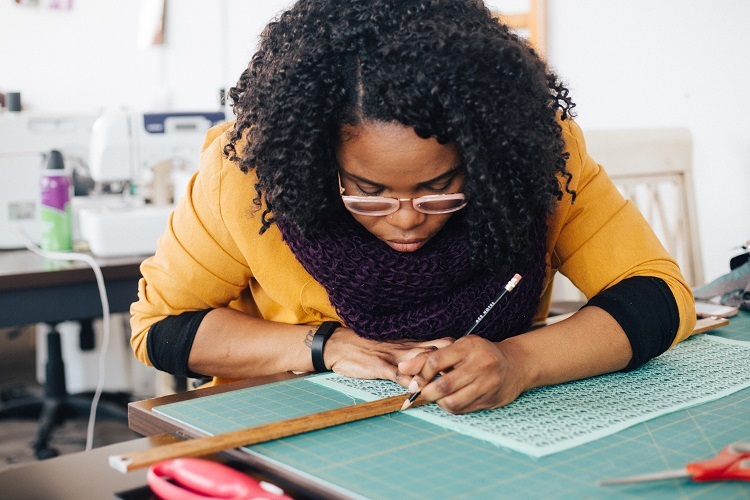 Knotzland, a bow tie company founded by Nisha Blackwell, is also located at 7800 Susquehanna and is part of Bridgeway Capital’s MONMADE initiative. Adam Kenney, director of the Craft Business Accelerator at Bridgeway Capital, said the program is designed to help artisans grow their businesses and have the opportunity to create jobs for others. “The big goal of MONMADE is to create a craft manufacturing sector,” Kenney says. Adam Paulisick, founder of coworking space The Shop-Homewood on Dallas Avenue, said The Shop and MONMADE have similar ambitions in fostering those who “want to work with their hands and their hearts.” But he wants The Shop to be viewed as a launch pad for entrepreneurs into larger programs. The coworking space is cashless, so there is no cost for individuals to join. The currency used to pay for working space is time put back into the community through volunteer hours. “We want to make sure people don’t have an excuse, like their wallet, not to celebrate the talents they have,” Paulisick says. Currently, there are three tenants of The Shop: renowned painter Ashley Cecil, who is also Paulisick’s wife, master barber Nate Mitchell and the innovation lab of the Homewood Children’s Village. Executive Director of HCV Walter Lewis says The Shop has been vital for students and adults. Homewood Children’s Village staff have received training sessions from Google and the U.S. government, and two Learn & Earn sites operate out of The Shop. The post Discover some of the people and places growing beautiful things in Homewood appeared first on NEXTpittsburgh.